Some pitches are mistakes, but this was not one of them. After Delgado missed McCutchen with a 95 mph fastball on the first pitch, he made sure that would not be the case with the third pitch. He came back inside with another 95 mph fastball right in the small of Cutch's back. As you can see from the photo above, it was enough to drop him to the ground. While it looked like Cutch would avoid an injury, it is hard to imagine the fastball did not lead to his avulsion fracture. This all stemmed from a wild pitch by Ernesto Frieri the evening prior which resulted in Diamondbacks' star Paul Goldschimdt's hand being fractured, and likely ended his season. It is time for the big leagues to put their big boy pants on and rewrite "the code" in their respective sports. Major League Baseball's code is simple and straightforward. If you hit our player, no matter the reason or intent, we will hit one of your players who is equally as good, if not better. Also, if you admire a ball you hit 400+ feet, we are going to hit you then as well. Does this not sound childish to anyone else? A 95 mph fastball has the ability to significant injury. I am not talking about broken hand significant, but long-lasting damage. If that ball hits Cutch and he is partially paralyzed, does Major League Baseball then react? They not only did not suspend anyone on the Diamondbacks, but they did not even receive a fine. The most Delgado received was an ejection in a game the Diamondbacks were losing handily anyway. So why bring this up on a hockey site? Well, the first thing that ran through my mind after seeing Cutch was the Brooks Orpik incident from earlier last hockey season. It is an incident fans know all to well, and it invokes an image like the one seen above. A horrific scene for everyone watching at the arena and at home. It is one that should not happen, or be allowed to happen, in sports... on purpose. That evening, Brooks Orpik laid a clean hit on Loui Eriksson, one of the Bruins' better forwards. It knocked Eriksson out of the game, presumably with a concussion. It also prompted Bruins' enforcer Shawn Thornton to blindside Brooks Orpik; knock him out cold, and then proceed to keep hitting him while he was unconscious. For his efforts, Thornton received a 15 game suspension. It was much more than MLB's laugher with Delgado and Gibson, but 15 games, for mugging? For assault? It is not even a quarter of the NHL season. 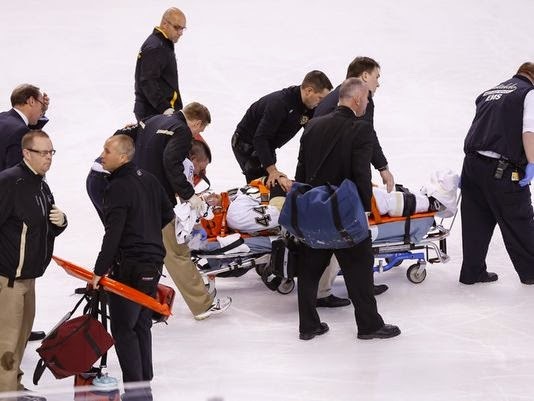 If Brooks Orpik could not walk again, would the NHL then react? 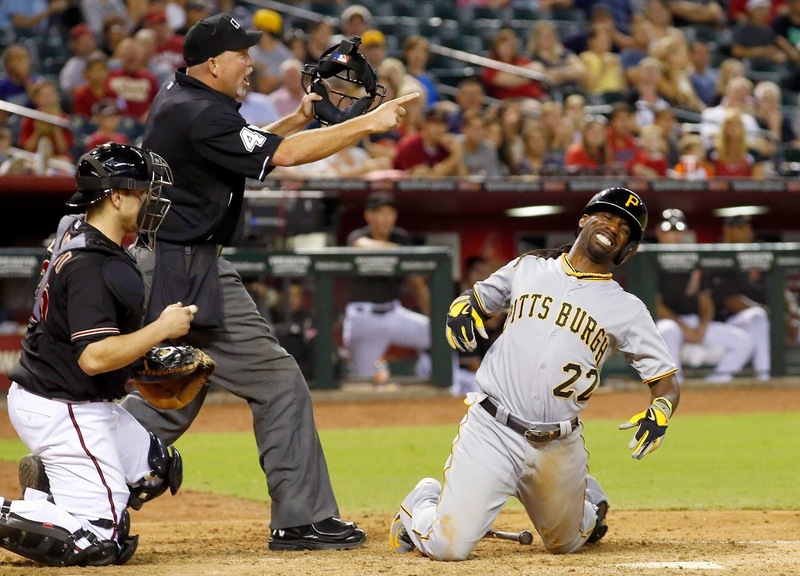 The Andrew McCutchen incident showcased the worst in an otherwise beautiful sport to play and watch in baseball. The Brooks Orpik incident likewise showcased the worst the NHL has to offer. It is time for both leagues to step up to the plate, no pun intended, and put rules and safety measures in place to protect their players and the integrity of their respective games. It is a plea to not wait and react, but rather to be proactive before someone gets seriously injured by one of the unwritten rules in "the code" -- a fictional book seemingly written by children on a playground, not by men who are supposedly role models.